Serge Lutens made a reasonable enough showing in our latest poll on scrubbers (as did most major brands, mind you). Contenders included Iris Silver Mist (those people are obviously crazy), Jeux de Peau (surely a love-it-or-hate-it fragrance), Arabie, Fille en Aiguilles, and the subject of today's review, the new Laine de Verre. Laine de Verre, named for everyone's favorite source of fragrance inspiration, fiberglass, is the third fragrance in the L’Eau series that includes 2010's L’Eau Serge Lutens and 2012's L’Eau Froide, and if you're too busy to read a whole review today, I'll just start off by saying that reader Lady Murasaki's comment comparing Laine de Verre to Lemon Pledge was too kind. Really. We never get full lists of notes from Serge Lutens, but the short list for Laine de Verre — citrus, aldehydes, musk and cashmeran — sounded innocuous enough, and the short film for the scent was charming, in the usual, determinedly inscrutable sort of way that Serge Lutens prefers to communicate with his fans about his creations. And personally, I thought L'Eau Serge Lutens and L'Eau Froide were both just fine. If clean is what you're after and if you're willing to pay niche prices to get it, either one is worth a shot, although I did like L'Eau Froide best of the two. Surely there will be people who will love Laine de Verre as well, but I'm not one of them, and I do suggest you approach it with caution. The opening smells industrial, and it's industrial-strength, literally: if you apply heavily and then breathe in deeply, right away, nothing you do will get the smell out of the back of your throat for a good three or four hours at least. It's a massive burst of cold, soapy aldehydes and citrus, with a notably metallic edge. There are bits of fruit, and bits of something bitter and green and almost vegetal, and later, vague bits of "flowers". The interesting part (or the fun part, if you find it fun) is the first 45 minutes, when it's rather like a carbonated, possibly toxic potion made with soap bubbles and metal shavings, and garnished with a few sprigs of herbs and perhaps a wilting rose. After that, there isn't all that much to distinguish Laine de Verre from the many other contemporary fragrances (or functional products) that emphasize white musk, and that all smell, to one degree or another, like laundry detergent. Verdict: In addition to the Lemon Pledge and laundry detergent, Laine de Verre has been compared to the smell of hand sanitizer and soggy clothing. L'Eau de Serge Lutens was meant to evoke the smell of ironing; Laine de Verre, early on at least, calls up the scent of whatever cleaning product you might properly use to scrub down an operating room, or a chemical laboratory, or some other place that had to be absolutely, positively, clean. It's as though Serge Lutens decided to take (relatively) recent consumer preferences for clean, and push the envelope as far as it could be possibly pushed with modern chemistry. For that, I salute him: Laine de Verre would have made me laugh if it hadn't given me such a headache every time I wore it, and if smelling the lingering remains on my scarf had not made me feel slightly queasy. If you have a favorite clean fragrance, or if you loved Laine de Verre, do comment! 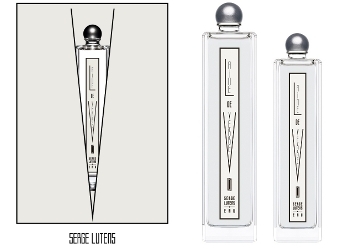 Serge Lutens Laine de Verre is available in 50 ($110) and 100 ($160) ml Eau de Parfum. For buying information, see the listing for Serge Lutens under Perfume Houses. Hope you like it better than I did! And oh, that was a lovely scent! Have not smelled the new version, but betcha it smells like laundry detergent now too. I rarely come up with a good description of a perfume but I think my description of this one fits your review: I said it smelled like a cruel detergent. Which it would have to, right, if it was called “Glass Wool”? Yes, perfect! And the name really does fit. Can’t think of the last time it bothered me to wear a fragrance as much as it bothered me to wear this one. I’m with you on L’Eau and L’Eau Froide – they don’t bug me (I quite like L’Eau Froide, would get some if I didn’t already have incense perfumes I don’t wear.) But I can’t imagine who would WANT to wear Laine de Verre. Hahaha–thanks, Robin, for the very fun read, and for sparing me what sounds to be the agony of spraying this on my person! Thank you, Robin. So, I’m not crazy to think that it is akin to Lemon Pledge. Industrial strength is so accurate a description! It is truly a bizarre creation… and not in any interesting way. Since no one wanted my sample, it has gone into a pile of “no way in a million years” samples, which I seem to have in abundance. I was really quite serious when I said you were too kind — I adore Serge Lutens, but I’d rather smell Lemon Pledge than ever smell this one again. It really (seriously, did not say it just for emphasis) does get stuck in the back of my throat, in a very unpleasant way. Blech. I’m not much for all that orientalesque-souk-ish stuff that Uncle Serge seems to put out (and I don’t think I commented, but Fille en Aiguilles was sure a scrubber for me – though I LIKED Serge Noir, go figure). And I get on just fine with aldehydes most of the time. I don’t feel inspired to have a sniff. I tend towards the “middle”, I think, for Serge: I like Douce Amere, Santal Blanc, Sa Majeste, A La Nuit, Chene, Attarine, Rousse, Un Lys, Iris Silver Mist, Rahat. Not the heavier orientals so much, and could do without the Eau series. But this, I think, is the only SL I ever wanted removed from skin immediately, although Borneo 1834 came close. Doubt you would like this, but you never know. There have been a handful of Serges I like, but they’re either the “friendly” ones like Sa Majeste and Douce Amere, or the very-perfumey La Myrrhe. This reminded me of people suggesting using Febreze as a perfume and even that might be a better option.. I walked by the Lutens counter the other day and took a sniff from the bottle cap and that was the most I could do to “sample” it. I didn’t think the ad for LdeV was charming. I felt quite stupid watching His Grace pace around for over a minute. And then I felt annoyed at his usual pseudo-intellectual twaddle. Nevertheless, the Creator of Chergui is beyond all reproach, lol! In hot weather I usually prefer clean smelling perfumes, but I would include Infusion de Iris, several vetiver, citrus and green scents, as well as some white musks like Clair de Musc. Bas de Soie is an odd one. I was surprised nobody brought it up in the scrubber poll! Or Fleur d’Oranger, which is another love-it-or-hate-it. At first I get a wonderful iris, and then Bas de Soie turns into dirty stockings! Perhaps it would be nice layered with glass wool for added texture! Oh, Fleur d’Oranger was in the scrubber poll. I missed it then, sorry! Ha ha, I had the same feeling – liked ISM, hated Bas de Soie. Well you can have your carrots (ISM). I’ll keep my wonderful silk stockings (BdS). Lol.. I like both ISM and Bas de Soie, so am I half insane? I also liked Fleur d’Oranger, though I remember thinking the drydown lacked a bit on me. But I haven’t smelled it in a while so I might need to get another sample or a decant. j/k, I actually sort of liked Bas de Soie too. Didn’t love it though. Laine de Verre is an industrial-sized scrubber for me too. I must be hypernosmic to some of the modern white musks (ab)used in niche perfumery, and I often had the pleasure to experience the bubbly chemical foam thing on my wrists… I’ve become a very cirncospect perfume sampler! Clean to me means slightly old fashion aldehydic perfumes, because soaps at some point in the Mesozoic smelt that way. White musk is like pink pepper to me – it give an air of sameness to everything. So agree, even though I like some of them too (Kai, yes!). Weirdly enough, I like CK Be as a clean scent; it smells just-out-of-the -shower-y but not in an overpowering chemical way. As for aldehydic/laundry clean, I’m a devotee of White Linen, but it only smells clean up top; the base is actually rather animalic. I wore CK One for years, but can’t remember CK Be at all! It was probably better, but I wasn’t paying much attention to fragrance at the time. I loved CK Be – it was my signature scent for a couple years. CK One i didn’t like and falls into the “sporty” scent category… So not my thang. I haven’t had much luck with the SL line, haven’t tried them all but most I just haven’t liked. His jasmines are good, Sarrasins & A La Nuit. Then I seriously doubt you need to try this one! I wonder about the name Laine de Verre (glass wool). Verre has two homonyms: vert (green) and ver (worm). So is SL playing with words here? From the review, I think Worm Wool sounds more appropriate. Laine de Verre sounds creepy and aggressive to me, but I would love to hear from someone who likes it. When I read your review, my response was ouch! and I have yet to read a positive review from anyone. However, somewhere on the planet are a team of people behind this particular fragrance and I guess there must be a targeted market. I recently had a weird experience with Lush Rose Jam which so many NST readers love. It really did not work for me AT ALL, but in the process of testing it I forgot where I’d spritzed it and sniffed my unscented elbow. I thought ooh, the dry down is kind of nice! It turns out that the scent of my own skin is clean and vaguely reminiscent of Play-Doh. Did you read Denyse’s review at Grain de Musc? She liked it more than I did. That’s so funny! Kevin hated RJ too, although I think he only tried the shower gel. I got a sample of this from SL and it was just weird. It mostly smelled like pure aldehydes to me – simultaneously fatty and metallic. It didn’t find it particularly huge or aggressive or even unpleasant, but it’s not something I’d want to wear either. It wasn’t a scrubber for me, just plain odd (but not in a good way). Glad you found it calmer than I did! Lutens Gin Fizz has been dubbed ” hot laundry” – That’s the one that evokes ironing and hot clothes right out of the dryer. I do think the original Eau de Serge Lutens did a good job of that too. I’ll be brave and test this since the SA at Barneys pushed a manufacturer’s sample on me without any prompting. My go to “clean” scents and yes, I may have my perfumista card yanked, are: Chanel Les Exclusifs 1932 and Guerlain Apres L’Ondee. I haven’t smelled 1932, but I do think many Chanels smell clean, in an almost chilly way. I agree that Apres l’Ondee smells clean – so glad to find someone else who smells that! For smelling clean I love Lime Basil Mandarin, 28 La Pausa layered with a bit of Acca Kappa White Moss, Stella McCartney Lily, Osmanthus Different Company, among others. I always forget about Stella McCartney Lily! Wonder if it’s selling? I never hear about it. Oh, TDC Osmanthus is a great one! I was intrigued by the name and the advertisement was very cute. But this fragrance is a failed experiment. I can sort of see what they were trying to do with this one, and to my nose Undergreen’s White has succeeded in doing that (in an interesting and fun way). SL didn’t. I will have to try White again! This smelled like Alien fabric softener–both metallic and weirdly mammalian. It is the smell of HR Giger’s clean sheets. Alien fabric softener — perfect. Wow. Sounds horrible. Might have to take a sniff just to say I did! For “clean” I like Kenzo Amour. Or maybe L’eau d’Hiver, which is just so soft and pretty. I avoid most overtly musky/laundry-esque fragrances, but I don’t mind scents with a clean musk drydown, like EL Sensuous, which has enough other stuff going on to keep it interesting. All good choices…and none of them smell like detergent. What I actually wear when I want a clean effect is Chanel 28 la Pausa or Guerlain vetiver. Iunx l’ether or Guerlain Meteorites will also do. A clean scent that I found compelling, although I don’t wear it, was one of the Andrea Maacks – Craft, I think. It smelled EXACTLY like when I was a small child in a bathtub full of hot water and Ivory soap, with the somewhat metallic smell of our hard water. However, reviews would seem to indicate that it does not smell that way to everyone. Maybe I’m just hyperosmic to a particular musk they used. That’s 2 mentions of 28 La Pausa. Interesting, I don’t think of iris as clean, really, although maybe Infusion d’Iris comes close. I think of clean as any scent somehow contrary to the smell of sweat, so I de Iris Edp fits, though iris silver mist does not quite. I haven`t had the plesure of smelling any of SL creations yet, but this month my favorite prefume store in Oslo is taking them in. So excited! So wich one do you guys recommend me trying out first. I do not think that Laine de Verre is the one going on my “buy”-list. Oh, hard to even pick! I would say just play, but maybe would be fun to start with the earlier ones, 2001 and before? This is my all-time favourite house, but I haven’t really liked any new releases since Jeux de Peau. Sadly, I go back farther…the last one I wanted was 2008, Attarine.